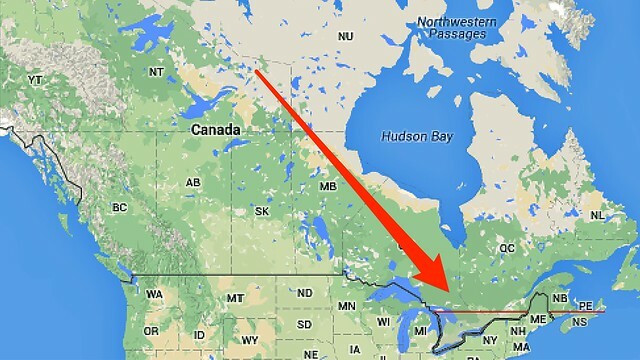 This map of Canada shows the country’s familiar vastness. A single line drawn across its deep south adds a surprising layer of information. The line runs well below the 49th parallel that constitutes that long straight stretch of U.S.-Canada border from Point Roberts, WA to Lake of the Woods, MN… Split in two by the U.S. state of Maine poking north, the line traverses four eastern provinces, cutting off the southern extremities of Ontario, Québec and New Brunswick. Nova Scotia is the only province that falls mostly below the line. As we conquer the divides, we might send adventurous birthday greetings to Hugh Clapperton; he was born on this date in 1788. 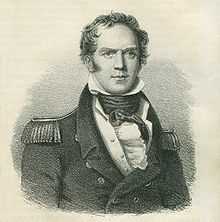 A British naval officer, Clapperton saw action in the Napoleonic Wars and in Canada before volunteering for an expedition to explore Africa. He made several such journeys, helping to chart West and Central Africa, and was the first European to to make known from personal observation the Hausa states (in what we now call Nigeria). Clapperton ended his career sailing in an action aimed at suppressing the slave trade.